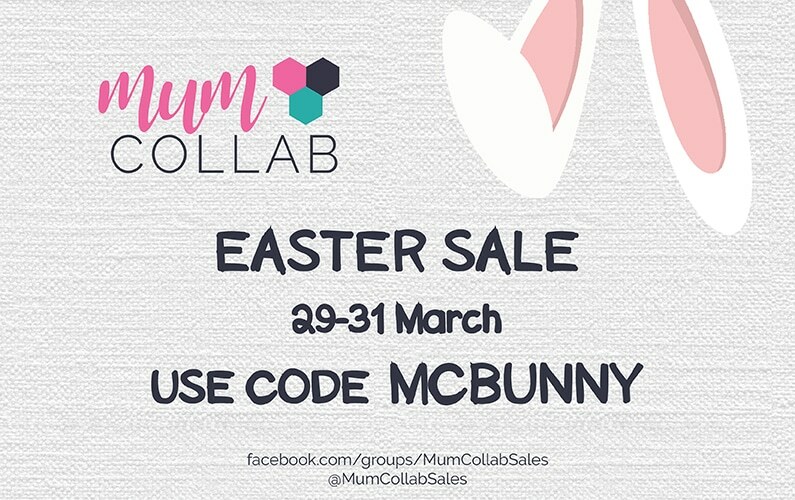 Mum Collab Easter Collective Sale ON NOW – hop to it! Get ready to save on everyday family essentials and gorgeous products for you and the kids because the Mum Collab Easter Collective Sale starts NOW! 46 Aussie brands for mums and bubs have come together to offer you BIG discounts of between 15-40% off their ranges. The Sale will take place from now, 9am Friday 29th to 11.59pm Sunday 31st March 2019 AEDT and each store will share the same discount code. This code will work for all websites of the brands involved and should automatically deduct their particular discount amount. Join our Facebook group here so you don’t miss out on extra announcements. The following stores are taking part (listed in alphabetical order). Click through to find out what each has to offer. Don’t forget to join our Facebook group here! 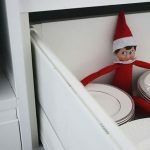 Disclosure: this post contains some affiliate links meaning if you click through and make a purchase, I may receive a small commission. This doesn’t affect the price you pay. 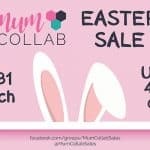 Happy shopping at the Mum Collab Easter Collective Sale!